Hitters can only tip - works on hitter awareness of open spots and how to read the defense. Also helps defense learn to read the hitters and adjust their passing when popping up a tip. Hitters must hit to deep corners - hitters practice hitting to a *typically* open spot on the court. Defense learns to adjust against teams who hit hard line shots and deep cross-court. Setter occasionally dumps the ball - teaches defense to read the setter and holds them in base a little longer so the must move into defense quicker. Let’s the setter practice good areas to dump the ball to and encourages stealth. 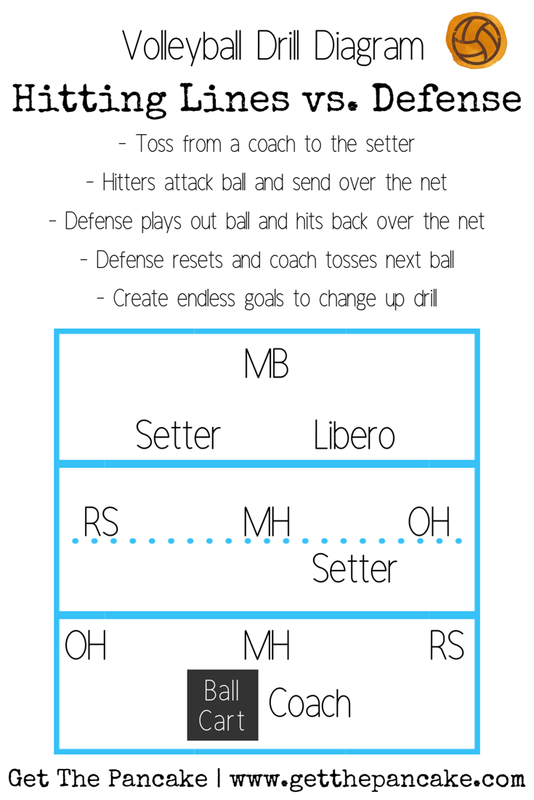 Hit only to the backrow setter and have your libero or second setter practice taking the second ball - teaches how to run out-of-system plays and trains backup setter when to move to the ball. What variations can you think of? Share your variations of this drill so we can all grow together in teaching this great sport! As always, I ask that you comment with any requests you have! Also, I’m stepping up my “social” game, so be sure to follow me on Instagram and Pinterest, like my Facebook page, and subscribe to my YouTube channel! All @getthepancake :) Hope to see you there!